Deploy the Cisco 2500 Series Wireless Controller to manage wireless functions in your small to medium-sized business. 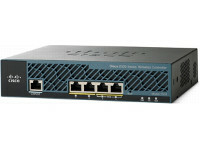 The Cisco 2500 Series Wireless Controller helps Cisco Aironet access points communicate in real time to simplify the deployment and operation of wireless networks. Wireless Standards IEEE 802.11a, 802.11b, 802.11g, 802.11d, WMM/802.11e, 802.11h, 802.11n. Wired/Switching/Routing IEEE 802.3 10BASE-T, IEEE 802.3u 100BASE-TX specification, 1000BASE-T, and IEEE 802.1Q VLAN tagging. Note: Access point directly connected to the controller is not currently supported.